But could it be that much of their overheated rhetoric was just for show and that actually the Islamists see more than enough silver lining in a Trump victory? 1. This is a HUGE Opportunity for Fundraising. 2. The election confirms a useful narrative: that America is an inherently racist country, and that "Islamophobia" is an extension of the same primitive mindset. 3. Many Islamists – especially those in the rank-and-file of the movement – preferred Bernie Sanders to Hillary Clinton. Compare the two groups of Islamists who donated to Clinton and those who supported Sanders and a clear pattern emerges. Sanders received many more donations of a small size: 242 donations totaling $9,485, making for an average donation of $39. Clinton received $67,656 in 163 donations, $415 the average. It may be that the Islamist leaders out in the field, working at the grassroots level, preferred one candidate and the Islamist board members in the background with the money to fund campaigns and CAIR chapters preferred another. 4. Trump is at least more likely to provide comic relief than another round of the Clintons. 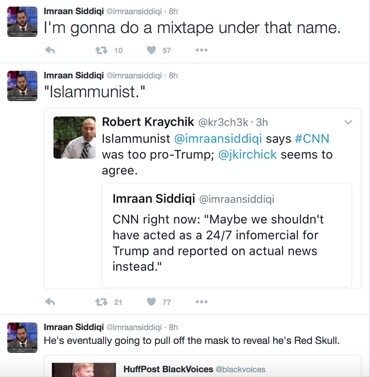 CAIR-AZ executive director Imraan Siddiqi likes to use humor to make his ideological opponents look ridiculous. See any other unusual Islamist reactions to the election? Send them to me at Swindle@MEForum.org.